This is a modified version of a MiG-21MF camo skin from "Marcfighters", I hope it will be useful in the new mod "Scandinavia". Good hunting, I wish you ! 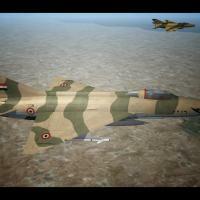 This represents two skins of the VVS MiG-21PFM in Afghanistan war. 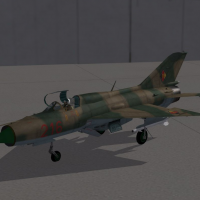 This is my attempt to present this skin, I did not find much information, this is a modification of the existing TW skin, I hope you will like it, there are two versions of the Soviet and Afghanistan MiG-21bis, you choose which one you like. Good hunting. This is my attempt to present this skin, I did not find much information, this is a modification of the existing TW skin, I hope you will like it, there are two versions available, you choose which one you like. Good hunting. 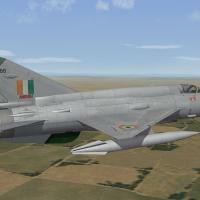 MiG-21 Fishbed Skin Set for F-13/FL/PF/PFM versions used in Middle East by Egypt,Syria,Iraq. Ive made several camo skin sets because i was bored of stock ones in Wings Over Israel. So this will bring some more colors to game. I think its around 17-18 skins. With some diferences so its not boring anymore..at least for me. Paints are mostly based on photos (usually poor quality). Pack includes only skins. There is no ini files, for decals etc. So it can be easly configured for your use. Just replace old ones or just create new folder fornew paint. 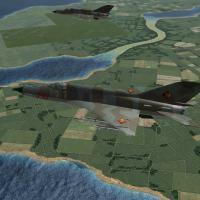 These two East German Mig21-PFM skins are from my personal GermanyCE MOD folder. And I would like to share them with you. I weathered the skins because the stock ones look to shiny fot my taste. Drop in your "\Objects\Aircraft\MiG-21PFM" folder and enjoy. 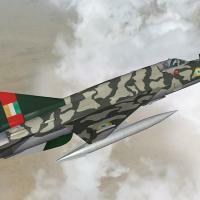 Mig-21 PFM 80's Camo Skin. This mod is made for SF2. In the east german airforce LSK (Luftstreitkräfte) each single plane had a unique paint scheme. There was no standard for the form of staines, dots or stripes. So the technicians of the squadrons and repair facilities had free hand for the paintshop. Originally it was intended to have a two tone camo. The colors had to be brown and green. But the tone of the paint was not specified, so that lighter and darker greens and browns were possible. It depended a lot on the availability of the paint. On the other hand the brown paint was very fast weathering, so that it appeared soon as a green tone. Nobody knows why the paint changed from brown to green. It simply happend. Perhaps it had something to do with the sun? So a very wide range of colors was to find on the planes. In the late 80th a 3 tone camo was used.
. So i decided to make this set as freestyle. A NVA MiG-21 could have looks like that, what you find in this package. 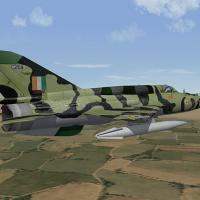 The tactical numbers are made by PauloPanz for his MiG-21F-13 skin.! TK's stock skin, modified by me. The camo decals are made by me. 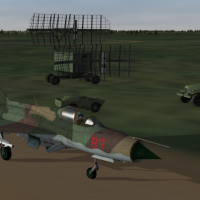 The MiG-21camo set is FREEWARE. COMMERCIAL USE IS NOT ALLOWED! 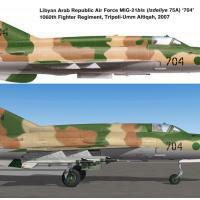 Libya Air Force skin for MiG-21MF..
IrAF No.9 Squadron was the first unit to be deployed in Syria at the October 1973 War(Ramadan War). On Oct 6, 1973 at 16.00 the Squadron was put in alert and ordered to transfer from H-3/al-Wallid to Syria. Dmeyr and Tsaykal ABs. CO was Maj Namik Saadallah. 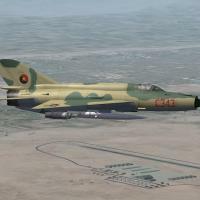 The MiG-21PFMs arrived in Syria uncamouflaged and were painted with standard SyAAF colours during the night from 7 to 8 October 1973. IrAF MiG-21PFMs(serie numbers 702 to 705, 710 to 737)were from 1968 wired to use GP-9 gunpod. By the October 1973 War the missiles remained the standard R-3S. The first batch of the much improved R-13M1(Atoll AA-2D)arrived in Iraq in 1974. 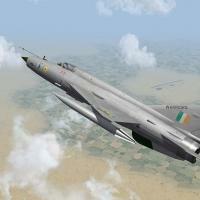 Tri-Grey Indian Air Force MiG-21bis skin based on Comrad's excellent MiG-21 2048X2048 templates. extract the contents of the file to Objects folder. 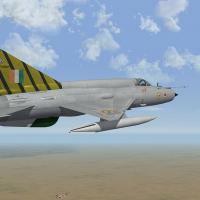 No.45 Sqdn "Flying Daggers" MiG-21bis skin based on Comrad's excellent MiG-21 2048X2048 templates. 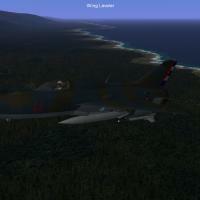 No.15 Sqdn "Lances" MiG-21bis skin based on Comrad's excellent MiG-21 2048X2048 templates. 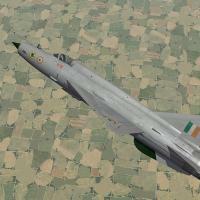 No.21 Sqdn "Ankush" MiG-21bis skin based on Comrad's excellent MiG-21 2048X2048 templates. 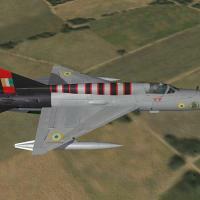 No.24 Sqdn "Hawks" MiG-21bis skin pack based on Comrad's excellent MiG-21 2048X2048 templates. 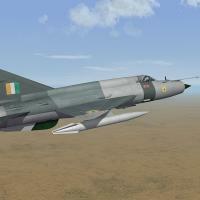 No.26 Sqdn "Warriors" MiG-21bis skin pack based on Comrad's excellent MiG-21 2048X2048 templates. Also inclused an altered data.ini which removes the odd rods antenna. 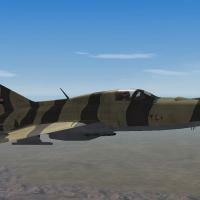 The skin was inspired by Lazarus1177's excellent work(http://combatace.com/files/file/15585-iaf-no26-sqn-mig-21bis-skin-mini-pack/). Lazarus1177 - For his No.26 Sqdn skins. 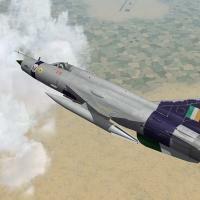 No.4 Sqdn "Oorials" MiG-21bis skin pack based on Comrad's excellent MiG-21 2048X2048 templates. 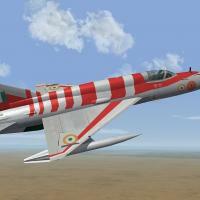 No.3 Sqdn ''Cobras" Indian Air Force MiG-21bis skin pack based on Comrad's excellent MiG-21 2048X2048 templates. Pack also contains serial number of all 290 IAF MiG-21bis airframes, a lot of which later went to be upgraded to Bison(21-93 UPG) standards. 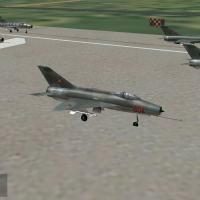 The MiG-21bis was license Manufactured in India by Hindustan Aeronautics Limited as the Type 75 MiG-21bis.